You can play drums... without a real drumkit! Discover how Virtual Drums works. 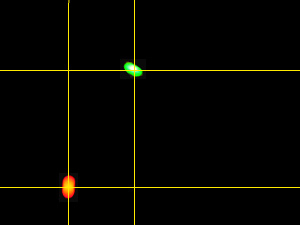 Video acquisition of the 2 cameras simultaneously, at a frequency of 30Hz. At this step, image data are huge: 640 * 480 * 3 bytes * 2 cameras * 30Hz = 55Mb/s transferred on the firewire bus! Setup the camera parameters: gain, saturation, white balance, shutter speed. 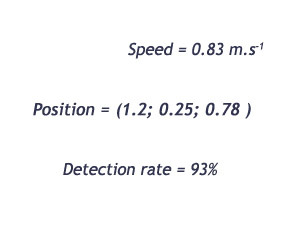 The resulting image resulting is then easier to analyse. Algorithms designed to process the colors and detect shapes are processing the images. At this step, we have to ignore the noise and all other colors but the sticks. We finally have the 2d positions of the sticks on the screen. 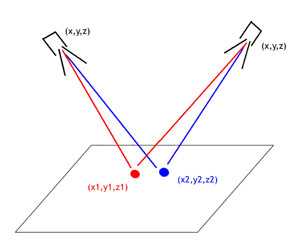 Because we have the 2d positions of the sticks on the screen, and because we know the position of the cameras in 3 dimensions, we can determine via geometrical algorithms the 3d positions of the sticks. We also handle the distortion of the lenses. Once the sticks are detected, we process their speed. We also look for other pertinent information such as apparition frequency, percentage of theoretical object similarities, etc. 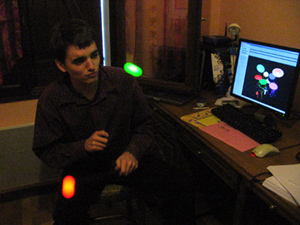 Using a positioning algorithm, we determine if the stick is hitting a drum element. We then compute the sound localization and the volume, depending on the speed. The 3d Interface displays in real time the sticks and the whole drum kit. 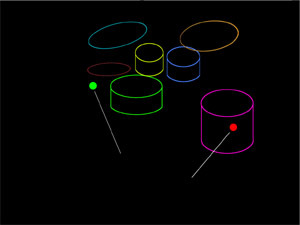 Drums are highlighted each time the player hits it. The fun is maximum! 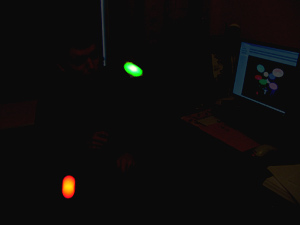 Discover Frozen Cameleon, the color calibration software especially developed for the virtual drums project. - What type of camera have you used? - What image acquisition software do you use for the camera? - Which technology have you used for the programming? - Which parts have you developed yourself? 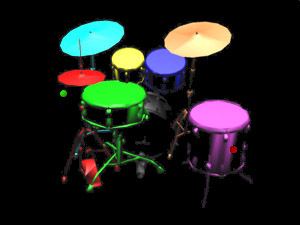 This website is about the virtual drums system. It is a software that makes possible to play drums without a real drum set, only with 2 cameras and a piece of software we developped.